Winning strategies at the bargaining table that can help avoid conflict Collective bargaining can pose unexpected difficulties and surprises for un prepared foreign management. In the discussion below, the crack labor law team of CW Hyun, Dean Fealk and Park Jung-Taek from the leading Korean legal firm of Kim&Chang, suggest some strategies that can help avoid unnecessary conflict at the negotiation table and help management build amicable relations with employees and their representatives. What does the law say about collective bargaining? First off, we'd like to point out that labor relations at multinational companies in Korea are harmonious on the whole. At Yuhan- Kimberly Korea, for instance, workers and management interact largely as if they are family. However, employers should be at pains to address all the issues in the workplace and maintain communication with all employees. With regard to the legal framework governing collective bargaining we should begin by noting that it is possible to form a union with just two employees. A union becomes the representative organization of the employees at the company when it claims a majority of the employees as members. However, the employers must recognize the union, even if it does have only two employees-although with less than majority membership the union will speak and act on behalf of only their membership rather than the employees as a whole. In any event, a union may then request collective bargaining and the employer is obliged to negotiate with the union in good faith. If the employer fails or refuses to negotiate in this regard then such behavior falls under the rubric of unfair labor practices and becomes subject to possible criminal penalties under the labor laws. Parameters of unfair labor practices may be found under the Trade Union and Labor Relations Act (TULRA). As opposed to the United States or the European Union where unions at the company level are often branches of industry based national federations, their counterparts in Korea and Japan are recognized as independent units. While they can be affiliated with national or industry-level bodies, this does not imply they that they must surrender any of their bargaining power unless by their express say-so as we shall examine below. Should collective bargaining fail, the union may apply to the government for mediation, a step required before a strike is called. The number professional mediators is limited given the short history of labor relations in Korea, so the lot of mediation usually falls to the government, or more precisely the Labor Commission at the regional level. Should mediation, a non-binding process, fail, the parties may at their discretion apply for arbitration, which may be binding. However, arbitration is step rarely taken since it is applicable in a strictly limited number of cases usually related to situations where the public interest is at stake. For example, when the socalled "public sectors," such as the banking system or power utilities are threatened by industrial action. Private companies normally choose the nonbinding path of mediation. Following mediation, a strike vote can be called. The vote must be secret, and anonymous, based upon a direct question on the ballot, and be decided by a majority decision. What are typically the concerns of employees and management of foreign-invested corporations expressed during collective bargaining? In some circumstances, employees may feel their companies aren't yet a permanent fixture in Korea, so job security can be an issue. Under such a scenario, there could be a tendency in negotiations to "get what is available while the going is good." There may also be a perception abroad that foreign- invested companies have "deep pockets," so there sometimes tends to be different expectations on the part of employees about benefits and compensation they can offer. On the part of management, there is a continuing desire to introduce a performance- based system of remuneration as opposed to one based on seniority. Traditionally, one's status within a Korean company rises along with one's seniority. How should a company prepare for collective bargaining? Sometimes an employee survey could be helpful in determining what particular grievances they may have and what the issues in the workplace are. As unions will often focus on compensation and want to be in the forefront of the market, it might also be advantageous to do some market research on wages and salaries offered by the company's competitors. On gleaning this information, companies may be in a better position to offer compensation at the desired level of their respective industries in general. As mentioned, although initial mediation is typically non-binding mediation, it can have a psychological impact upon the parties and provide the momentum necessary for a successful conclusion of negotiations. If the mediator recommends certain figures, say a 5-percent increase in compensation and the union wants 10 percent, it would normally be very difficult to go beyond the lower figure. At bottom, the union has to demonstrate its demands are reasonable, since if it doesn't it will loose credibility. Unions may also try to leverage their position by making employees' job titles an issue in the bargaining process since a title is matter of great importance in a Confucian-based society such as Korea's. An important part of preparation is regular and accurate communication with employees over the company's financial position so they know what is going on and do not support unreasonable demands. Winning the support of line managers is often critical in this regard. Transparency is also vital in order that employees do not suspect the company is being less than forthcoming. Such initiatives often prove invaluable for building trust and having strong arguments at the bargaining table. In the event of a strike, how does management keep things running and maintain relations with suppliers? In the current legal framework this may be challenging and often requires advanced preparation since the use of replacement workers from outside the legal entity is not allowed. However, due to certain legal restrictions there may be certain classes of employees who are exempt from the strike call. Not all industrial actions are full-blown strikes. For example, sometimes they might take the form of a "work to rule." If management wishes to make redundancies, what proposals can management offer to make such a move palatable? Korea has drawn from the French and German models in this regard, whereby redundancies can typically be made only due to very tough business conditions. Under these circumstances one viable approach for effecting redundancies is by introducing a voluntary separation program involving "golden handshakes" for departing employees. The union may want to institutionalize its role in determining redundancies, insisting that it be consulted in this eventuality or be required to give its consent. Naturally, management will want to abandon as little control as possible. The union may then demand that employees receive extra compensation in the face of a reduction in the workforce. The prime reason under which redundancies are allowed is an "urgent business necessity," a term not clearly defined by statute. General Motors succeeded in winning redundancies-1, 750-at Daewoo Motor Co. but before its takeover of the stricken automaker. Understandably, most companies would rather be pro-active in shedding excess employees before the situation began to impact upon them financially, a concept that is gaining acceptance but remains controversial since a major concern of the courts is often the fate of the employees, given there is not a well-developed social safety net in Korea. Hence the popularity of voluntary separation programs, despite their expense. How can management gauge the support for the union among its employees and also at a regional or national level? Once a union claims a majority of a company's employees as its members, it has the right to represent all employees. Current labor laws do not permit a second company union although this is slated to change in 2007. While the company union is the legal building block of labor law, a movement under way is the de facto integration of such units into industrial unions, as in the case of autoworkers, bank workers and hospital workers. This means that their bargaining power in form or practice passes to the industry level unions. At the same time, more company unions are giving up their bargaining rights to the two major national groupings, the Korean Confederation of Trade Unions (KCTU) and the Federation of Korean Trade Unions (FKTU) as a result of, among others, pressure brought to bear upon them by these behemoths of the union movement. While only a small percentage of Korean labor is unionized-perhaps 11 percent-it is concentrated in certain industries and companies. Many conglomerate subsidiaries, and certain types of manufacturing and other industries for example, are heavily unionized while the level of unionization among multinationals tends to be low. In our work with multinationals, we help them create a working environment characterized by communication and receptivity in which the presence of a union may not be a necessary factor to address employee issues. What impact do national contract negotiations have upon company negotiations and how can management respond to them? In general, national contracts are not applicable to company unions unless they join an industry level bargaining unit. In this case, they are able to negotiate two contracts: one dealing with national level issues and a second focusing on specific matters of concern within the company. What pressures could or should company management bring to bear during the negotiating process ? The types of pressure that management can bring to bear ideally concern fundamental issues. Do the employees trust the management? If so, that is strong incentive for a union not to go on strike for frivolous reasons. Since there is a no-pay, no-work law now in effect, a union typically must demonstrate to its membership an extremely good reason to go on strike. That's perhaps the primary pressure at work. The other is making sure the employees know all the issues at play through constant communication. It's critical for management to have informal as well as formal channels of communications at their disposal. It really helps to know what's going on "behind the curtain," so to speak. By the same token, employees really want to know that their voice is being heard; they have to know that they are part of the team. In all, it's very important for foreign executives to know Korean labor culture and environment, and the sooner the better. For this reason we run seminars for senior managers so as to help them understand the terrain they are entering in Korea! While some foreign managers try to impose certain policies from their headquarters, they should to the maximum extent possible be adapted to the Korean environment. A good example is job titles. Under Confucian Korean society, title is "face," but this is something that's difficult for foreign management to appreciate. How would they know that children at school compare their fathers' titles? What we do is to find practical and often simple solutions that help solve often-big problems, for example, installing a suggestion box on the shop floor has been known to alleviate tensions in the early stages. October 12, 2005 - Free trade is expected to top the agenda for the leaders of the 18 member nations participating in the upcoming Asia-Pacific Economic Cooperation (APEC) forum, when they meet for a summit in Busan next month, Foreign Affairs and Trade Ministry said on Wednesday (Oct. 12). In the Nov. 18-19 meeting, the leaders will tackle ways of promoting free trade agreements (FTAs) and narrowing the gap between haves and have-nots, ministry officials said. Also likely to be included in their subjects for discussion are corruption, terrorism and high oil prices that are putting a stranglehold on the global economy. The leaders will discuss ways of promoting the so-called Bogor Goals. In 1994, the regional summit adopted the Bogor Goals that call on developed economies of the APEC to fully liberalize trade and investment by 2010, while developing economies will do so by 2020. Ministry officials said that the bird flu epidemic, which has killed scores of people in 11 countries across the world, will likely be given special attention so as to iron out collective measures to block its further spread. APEC members account for 56 percent of the world's gross domestic product, 46 percent of global trade and are home to 2.8 billion people. The upcoming APEC summit serves as an occasion to try and reach consensus ahead of the World Trade Organization (WTO)'s Doha Development Agenda (DDA) meeting scheduled for Hong Kong this December. The success of the DDA meeting is crucial as it is regarded as a prerequisite to the formation of a global trade framework. WTO director-general Supachai Panitchpakdi sounded a warning that no DDA success could lead to a major disruption in the world trade during the APEC energy ministers' meeting on Jeju Island last June. - Chronique Asie de RFI - Accords Corée du Nord "Un marché de dupes"
La Corée du Nord se déclare prête à renoncer à ses programmes nucléaires et à réviser le plus tôt possible sa position quant au Traité de non prolifération ( TNT). En échange de ce renoncement, Pyongyang doit recevoir de l'aide énergétique et des garanties de sécurité des pays qui ont participé aux pourparlers de Pékin. La Maison Blanche a assuré «ne pas avoir l'intention de l' attaquer ou de l' envahir en utilisant des armes nucléaires ou conventionnelles». Washington et Pyongyang se sont également engagés à «respecter mutuellement leur souveraineté, à coexister pacifiquement et à normaliser progressivement leurs relations». Quelle victoire pour Kim Jong Il ! Le numéro un nord-coréen a obtenu ainsi tout ce qu'il voulait : d'abord la reconnaissance de son régime, la première dynastie rouge de la planète. Ensuite, l'aide énergétique qui va permettre à son pays moribond de survivre et à lui même de se maintenir au pouvoir. Enfin, la garantie que les Américains n'attaqueront pas la Corée du Nord, comme ils ont fait avec l'Irak, pays inscrit lui aussi dans l'axe du mal. En contrepartie, le Cher Leader ne fait qu'une seule concession : il renonce à ses programmes nucléaires existants. Or, comme personne aujourd'hui ne connaît l'état réel du potentiel nucléaire nord-coréen, il est fort possible que cette promesse ne soit qu'une coquille vide. Profitant de son isolement, la Corée du Nord est passée maître dans l'art du bluff et de la surenchère en ce qui concerne ses capacités de prolifération. Pendant que la Maison Blanche, la direction de l'AIEA, les gouvernements chinois, russe, japonais et sud-coréen pavoisaient en soulignant «les progrès obtenus» ou «les résultats encourageants des pourparlers de Pékin», le peuple nord-coréen continuait à végéter sous la férule d'un dictateur sanguinaire qui ne se soucie guère de la disparition de quelques millions de personnes mortes de faim dans son pays pourvu qu'il reste au pouvoir. Pour les 23 millions de Nord-coréens renfermés dans le plus grand goulag de la planète, soumis depuis des décennies à une terrible répression, l'avenir est plus que jamais bloqué. Reste à savoir pourquoi les Etats-Unis ont réservé ce traitement de faveur au dernier bastion du stalinisme de la planète. Si la diplomatie américaine a opté pour la modération dans son dialogue avec Kim Jong Il c'est parce que sa marge de manouvre était limitée: envahir, mettre en place un blocus maritime de la Corée du Nord ou saisir le Conseil de Sécurité ne pouvaient qu'aggraver la crise. Après la signature de cet accord, le plus dur reste à faire. To celebrate the 60th anniversary of national liberation from Japanese colonial rule, various cultural events will be held around the Gwanghwamun area from noon to 6 p.m. on August 14. According to the organizer, the Committee on the 60th Anniversary of Korean Liberation, most of the events will allow participants to select their favorite program of choice. In particular, the "Children's Play Ground" program will offer a precious opportunity to learn about the history of Korea with lots of fun activities. As a main event, "Music Concert for Celebration of Liberation" will be held at Nandaemun on August 15 at 7 p.m. under the slogan, "New Beginning and Peace." All-time Korean hit music from the 1950s to the present will be performed by Kim Gunmo, Lee Mija, Patty Kim, Jo Sumi and An Sukseon. Nandaemun, the venue for the concert, can be reached by Exit 6, Seoul Station, Line 1 or 4 and Gwanghwamun, the venue for the other cultural events, can be reached by Exit 1 or 3, Gwanghwamun Station, Line 5. 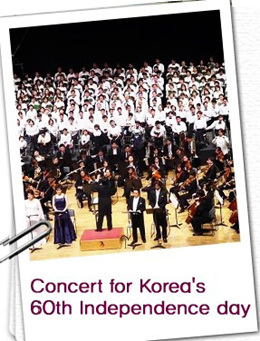 For more info, visit the website http://www.korea815.go.kr/ or call 3704-9483. Le pape Jean Paul II vient de s'éteindre et la planète entière salue la mémoire du successeur de Pierre. On ne sait pas quelle place aura dans l'histoire son pontificat mais on peut affirmer sans trop se tromper que Jean Paul II restera comme une des figures les plus marquantes du XXième siècle. 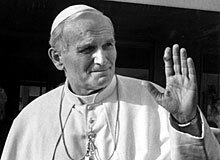 Karol Wojtyla a été élu pape le 16 octobre 1978. A l'époque, cette élection fut une immense surprise. Pour la première fois depuis plus de quatre siècles, les cardinaux avaient choisi un pape non italien, premier pape slave de l'Histoire. C'est un homme de 58 ans qui arrive à la tête du Vatican. Il est né en 1920 dans une petite ville près de Cracovie en Pologne, ce pays coincé entre l'Allemagne et la Russie qui a connu les deux totalitarismes du XXième : le nazisme et le communisme. Ordonné prêtre en 1946, Karol Wojtyla devient, en 1958, le plus jeune évêque de Pologne. Il sera cardinal en 1967. Résumer son pontificat en quelques minutes relève de la gageure. On ne retiendra donc que quelques actions marquantes. Et d'abord son rôle dans la chute de l'Empire soviétique dans les années 80. Pour beaucoup d'historiens en effet, tout est parti de Pologne et du mouvement syndicaliste Solidarité que le pape a encouragé lors de ses voyages sur sa terre natale. On se souviendra aussi du dialogue qu'il a entretenu avec les autres religions. Un cuménisme célébré dans la ville d'Assise en octobre 1987 en présence de 130 représentants des grandes religions. On se souviendra aussi de sa main tendue vers les juifs qui pour la première fois sous son règne ont cessé d'être considérés par les catholiques comme un peuple déicide. En mars 2000, Jean Paul II se rendait à Jérusalem et au Mur des lamentations, renouvelant sa demande de pardon à l'égard des fautes commises par l'Eglise envers les juifs. Jean Paul II c'est aussi cet infatigable voyageur. En 26 ans de pontificat, il aura effectué 140 voyages sur les cinq continents se rendant 2 fois en Corée du Sud, en 1984 et 1989. Partout, il défendait les mêmes valeurs : la liberté, les droits de l'Homme et le respect absolu de la vie contre la " culture de la mort. " Cette conception de la vie lui faisait à la fois condamner la guerre, le terrorisme mais aussi l'avortement ou les manipulations génétiques. Progressiste concernant les droits sociaux, Jean Paul II l'était d'une grande rigidité sur les questions de société. Défendant une morale familiale et sexuelle conservatrice, il condamnait l'utilisation du préservatif et refusait d'aborder la question soulevée par les Anglicans sur l'ordination des femmes. C'est un pape à la personnalité complexe qui est mort ce week-end. Son successeur sera élu dans trois semaines par 117 cardinaux électeurs. La Corée du Nord continue de souffler le chaud et le froid, n'en finissant pas de lancer de nouvelles menaces tout en laissant la porte ouverte à la discussion. Un nouvel épisode de cette diplomatie de l'équilibriste a eu lieu cette semaine. Mercredi, Pyongyang a à nouveau fait savoir qu'elle envisageait de revenir à la table des négociations à deux conditions. Premièrement que les Etats-Unis s'excusent pour l'avoir qualifié de " poste avancé de la tyrannie". Deuxièmement que les mêmes Etats-Unis acceptent de " renoncer à vouloir changer le régime communiste nord-coréen et qu'ils expriment clairement leur volonté politique de coexister avec la Corée du Nord". Voilà pour le chaud, même si cela ressemble à du tiède, l'essentiel étant que la Corée du Nord accepte à nouveau de négocier. Le froid est venu le lendemain. Pyongyang a annoncé qu'elle ne s'estimait plus liée par un moratoire sur ses essais de missiles à longue portée. Ce moratoire avait été décrété par la Corée du Nord elle-même en septembre 1999. Il était intervenu un an après l'essai au-dessus du Japon d'un missile Taepodong-1 d'une portée de 2 500 kilomètres. A l'époque, cela avait suscité de fortes craintes dans toute la région et avait poussé le Japon à chercher à se doter de ses propres défenses anti-missile. Aujourd'hui, ces nouvelles menaces sont prises avec plus de sang-froid. L'analyse qui domine est que Pyongyang cherche à faire monter les enchères en vue des prochaines négociations. Ce ne serait en somme qu'une provocation de plus. Fort de cette logique, les Etats-Unis par exemple ne veulent pas céder à ce qui peut être considéré comme un chantage. Leur position n'a pas varié : Aucune condition ne sera acceptée avant une reprise des négociations. " Nous serons prêts à aborder toutes les questions mais à la table des négociations ", a déclaré hier à Séoul l'ambassadeur américain Christopher Hill, également en charge du dossier nucléaire nord-coréen. Le régime de Pyongyang joue sur un registre qu'il connaît bien puisqu'il le pratique à grande échelle à l'intérieur même de ses frontières : c'est celui de la terreur. Ces coups de menton successifs n'ont pour objectif que de le replacer au centre du jeu. 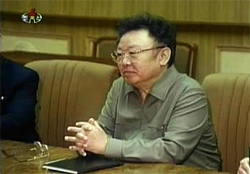 Kim Jong-il a compris qu'il existait du moment qu'il faisait peur. Mais ce jeu-là tourne à vide depuis un certain temps. Les chances que la Corée du Nord attaque un de ses voisins sont faibles comme est tout aussi faible la probabilité que les Etats-Unis attaquent la Corée du Nord. Le plus gros risque est ailleurs : celui de la prolifération des armes de destruction massive. La Corée du Nord peut très bien vendre sa technologie militaire à des organisations terroristes. Tout doit donc être fait pour faire revenir Pyongyang à la table des négociations. Cette année, les célébrations du mouvement de l'Indépendance du premier mars revêtent un caractère particulier étant donné que l'année 2005 coïncide avec le soixantième anniversaire de la libération du pays de l'occupant japonais, le quarantième anniversaire des normalisations diplomatiques entre Séoul et Tokyo mais aussi avec l'année de l'amitié entre les deux pays. Mais cette journée qui aurait dû être synonyme de journée de réconciliation entre les deux pays n'est pas aussi joyeuse que prévu du fait de déclarations "irresponsables" et malhonnêtes de certains hommes politiques japonais sur la souveraineté du territoire coréen. Et l'on pensera en particulier à l'ambassadeur japonais à Séoul Takano qui la semaine dernière a provoqué l'ire de la population coréenne suite à des propos déplacés de la souveraineté du Japon sur l'île Tok en mer de l'Est. On ne sait pas trop quel est le calcul politique ou diplomatique de Takano, mais cela est un jeu dangereux qui peut coûter cher à tout le monde. Refuser d'admettre une partie de l'histoire coloniale japonaise sur la péninsule ou la nier, c'est insulter les Coréens, mais aussi rabaisser le peuple japonais. Refuser cette histoire c'est également refuser la réconciliation entre les deux peuples et nier la réalité. En effet, même si les deux pays ont connu plus de bas que de hauts ce siècle dernier, les efforts qu'ont déployés les gouvernements successifs de Séoul et de Tokyo depuis 1945, et surtout depuis le début des années 1990 montrent que les deux pays ont changé. Les échanges humains et culturels entre eux ont considérablement augmenté, ce qui a permis aux deux peuples de mieux se communiquer et de mieux se comprendre. Certes il existe entre de nombreuses batailles entre la Corée et le Japon mais celles-ci se bornent désormais à des domaines économiques, sportifs ou à d'autres domaines pacifiques. Aussi le plus important en ce jour du mouvement d'Indépendance du premier mars est-il de se rappeler de l'idée de la paix et de la résistance non violente des Coréens. Et qu'en 1919, 9 ans après l'annexion de la péninsule, les centaines de Coréens qui défilaient dignement dans les rues, drapeaux à la main, pour protester contre la présence japonaise le faisaient pacifiquement. Une marche pacifique sans précédente dans l'histoire de l'humanité, qui a conduit au sacrifice de nombreuses vies pour la liberté mais qui a fait du peuple coréen un peuple uni. Une unité qui a permis à la Corée d'être ce qu'elle est aujourd'hui. C'est à dire une puissance économique. Le leader nord-coréen Kim Jong-il a donc dit lundi dernier que la Corée du Nord retournerait à la table des négociations si certaines conditions étaient réunies. Le dictateur a également appelé les Etats-Unis à faire preuve de « sincérité ». Comme souvent, les paroles du dirigeant nord-coréen sont difficiles à interpréter. Il ne sort jamais tout à fait de lambiguïté, cest le roi de lesquive. Cette déclaration a ainsi donné lieu à deux interprétations contradictoires. Pour certains, il sagit dun retournement spectaculaire de la position nord-coréenne par rapport au 10 février dernier. Pyongyang avait alors annoncé quil possédait larme atomique et quil se retirait des pourparlers à six pour une durée indéfinie. Les autres au contraire ne voient rien de nouveau dans la déclaration de Kim Jong-il. Ils soulignent que le dictateur a posé des «conditions» à son retour à la table des négociations, ce qui est une position constante de la Corée du Nord, alors que les Etats-Unis ont toujours réclamé de reprendre les discussions sans aucune condition préalable. Entre ces deux analyses antagonistes, on peut trouver une ligne médiane. Il paraît excessif de parler de revirement ou de coup de théâtre à propos de cette déclaration. Elle ne signifie nullement quun nouveau round de pourparlers à six sera prochainement organisé. Les divergences de vue entre les Etats-Unis et la Corée du Nord sont toujours présentes. En réalité, elles ne sont ni plus ni moins importantes quelles ne létaient avant le 10 février. Autrement dit, la situation est toujours bloquée mais elle a cessé de se dégrader. Lannonce du 10 février avait eu pour conséquence de radicaliser les positions des uns et des autres. Elle avait notamment mis les Etats-Unis dans une position extrêmement inconfortable en révélant limpuissance de lOncle Sam à régler ce dossier délicat. Elle faisait craindre que la Corée du Nord ne choisse définitivement la politique du pire. Aujourdhui, nous sommes revenus à la case départ. Après avoir violemment claquer la porte, Kim Jong-il ouvre une petite fenêtre. La reprise des négociations nest pas certaine mais elle est de nouveau possible. Si, à la manière des portraits chinois, lesdifférents pays du monde étaient assimilés à des personnages célèbres, nul doute que la Corée du Nord jouerait le rôle du Dr Folamour. Comme le héros inquiétant du film de Stanley Kubrick, le régime de Pyongyang ne cesse d'évoquer l'arme nucléaire qui serait en sa possession, et son envie dévorante, semble- t-il, d'y avoir recours. elle-même. Les spécialistes d'un des pays les plus fermés de la planète en sont réduits à émettre des hypothèses quant aux objectifs réels de Kim Jong-il et de la dynastie familiale au pouvoir. "Sans doute cherchent-ils à se faire payer cash pour accepter de reprendre les négociations interrompues l'an dernier ", avance Pierre Rigoulot, auteur de Corée du Nord, Etat voyou (Buchet- Chastel). "Nul doute que Pyongyang réclamera une aide économique supplémentaire à son voisin du Sud. En tout état de cause, une attaque nucléaire me paraît impensable. " Utiliser l'arme atomique pour arracher des concessions à ses interlocuteurs, c'était déjà la technique du docteur Folamour, énoncée vers la fin du film: "A quoi sert une machine qui peut provoquer la fin du monde si on la garde secrète?". NDLR : Sur les souffrances d'un peuple sacrifié à cette politique insensée, lire aussi "Évadés de Corées du Nord" (Belfond) de Juliette Morillot et Dorian Malovic. Roh Moo-hyun a donc terminé sa tournée européenne par une visite en France. Le président de la République a été reçu hier à lElysée par son homologue Jacques Chirac. Cest la première fois depuis son élection en 2002 que le chef de lEtat se rendait dans lHexagone. Comme dans la plupart de ses déplacements à létranger, Roh Moo-hyun a voulu mettre le dossier nucléaire nord-coréen au cur des discussions. Jacques Chirac a réaffirmé le soutien de la France dans la recherche dune solution pacifique à cette crise. Paris nest pas directement impliqué dans le dossier mais sa position peut avoir son importance. Des voix commencent à sélever pour rejeter le rôle de médiateur jusquici attribué à la Chine. Les Etats-Unis ont souvent par exemple reproché à Pékin de ne pas peser suffisamment sur Pyongyang. En Corée du Sud, certains commentateurs commencent à se demander si la Chine joue le jeu et souhaite vraiment de trouver une solution à cette impasse. En cas déchec prolongé du processus de Pékin, une solution est avancée : faire appel à un autre médiateur. Les Nations-Unies et pourquoi pas lUnion Européenne. Cette hypothèse apparaît peu probable pour le moment mais elle mérite dêtre explorée. Dans ce cas, la France aurait un rôle à jouer. Membre permanent du Conseil de sécurité, elle sest toujours montrée ferme vis-à-vis du régime de Pyongyang. Paris est la seule capitale européenne à ne pas entretenir de relations diplomatiques avec la Corée du Nord. Sur le plan des relations économiques, Jacques Chirac a souhaité quune «nouvelle impulsion» soit donnée. La Corée du Sud est le troisième partenaire commercial de la France en Asie. Cette coopération a été symbolisée par linauguration en avril dernier du TGV coréen, le KTX reliant Séoul à Busan. Il y a aussi les réussites dentreprises tel que Carrefour. Le groupe de distribution présent dans le pays du Matin clair depuis 1996 vient dannoncer quil allait investir 254 millions de dollars dans le pays au cours des deux prochaines années. Jacques Chirac a souhaité que ce partenariat se développe «dans les grands secteurs davenir». Des accords de coopération dans les domaines de lénergie, des technologies de linformation, de lenseignement supérieur ont été signés entre le ministre français de lIndustrie et ses homologues sud-coréens. Les présidents français et sud-coréen se sont mis daccord pour préparer un programme dévénements culturels en 2006. Cette année-là, les deux pays fêteront le 120ième anniversaire de létablissement de leurs relations diplomatiques. Un groupe de travail coprésidé par les ambassadeurs des deux pays a été créé pour loccasion. Le gouvernement sud-coréen nattachait pas le même degré de priorité aux relations avec lEurope quà la coopération avec la Chine, le Japon et les Etats-Unis. Mais depuis que Roh Moo-Hyun est devenu président de la Corée du Sud, en décembre 2002, lEurope est devenue une source dinspiration pour le chef dEtat en tant que modèle dintégration régionale réussie. Occupant une place importante au sein de lUnion européenne, la France est perçue par la Corée du Sud comme un pays qui compte, doù lintérêt pour Séoul de renforcer son partenariat avec Paris dans! plusieurs domaines, notamment dans les échanges commerciaux et la coo pération dans le secteur des technologies de pointe. Parmi les pays européens, la France est le troisième investisseur en Corée du Sud, derrière les Pays-Bas et lAllemagne. Ses investissements dans ce pays représentaient léquivalent de 3,4 milliards de dollars en septembre 2004 et le commerce bilatéral devrait dépasser les 5 milliards de dollars cette année. Mais la visite de Roh Moo-hyun en France a également un objectif politique : obtenir le soutien du gouvernement français pour aboutir à la paix et mettre fin à linstabilité dans la péninsule coréenne. Car la Corée du Nord reste au centre des préoccupations du gouvernement du Sud et toute la politique étrangère de Séoul est conçue à travers le prisme du problème nord-coréen. Conscient que tout regain de tension dans la péninsule entraîne un coût immédiat pour son économie, la Corée du Sud tente constamment déviter deux écueils aux conséquences potentiellement dramatiques : un conflit armé qui pourrait se solder par au moins un million de morts sud-coréens et une implosion de la Corée du Nord, entraînant lafflux de réfugiés le long de la zone démilitarisée et, par conséquent, une réunification précipitée au coût vertigineux. La France a une position très claire sur le problème nord-coréen : elle soutien le «processus de Pékin», cest à dire, les pourparlers à six sur le programme nucléaire militaire de Pyongyang. Paris estime «quil est dangereux que la Corée du Nord puisse détenir une arme nucléaire. Et que tout doit être fait pour convaincre ce pays à accepter les inspections internationales», comme la affirmé la ministre Michèle Alliot-Marie lors dune récente visite en Chine. Par ailleurs, la France est le seul pays européen à ne pas avoir établi des relations diplomatiques avec la Corée du Nord. Et elle refusera de le faire tant que ce pays maintiendra son projet nucléaire et ne respectera pas les droits de lHomme. ¤ Chronique Asie, 25/11/2004 14:08 - Corée du Nord : le régime se fissure en Corée du Nord. Selon le quotidien américain The New York Times, 130 généraux nord-coréens auraient fait défection. Ils auraient demandé lasile politique à la Chine et se trouveraient depuis deux mois à Pékin. Les quatre militaires les plus gradés auraient été incorporés à larmée chinoise, probablement pour laider à se déployer en Corée du Nord au moment de la chute de Kim Jong Il. La Chine serait elle même derrière la campagne de déstabilisation qui pourrait conduire à leffondrement de lun des derniers régimes totalitaires de la planète. Les premiers indices du mécontentement chinois à légard de son voisin sont apparus lorsque les autorités de Pyongyang ont fait échouer le dialogue à six sur le dossier nucléaire nord-coréen. Pékin sétait engagé à fond pour obliger la Corée du Nord à négocier et à faire des concessions à la communauté internationale mais Pyongyang a préféré boycotter les pourparlers qui devaient souvrir à Pékin fin octobre. En outre, les Chinois ne pouvaient plus supporter lafflux de réfugiés, le fardeau de lassistance à un système en faillite et, surtout, le chantage nucléaire de Kim Jong Il. Aujourdhui, la Chine semble prête à lâcher un régime avec lequel elle avait vécu jusquà présent dans une parfaite symbiose. Elle serait même disposée à encourager une faction de larmée nord-coréenne à faire un coup dEtat pour libérer la Corée du Nord de lencombrant Kim Jong Il. Compte tenu du pourrissement de la dynastie rouge, au pouvoir depuis les années 50, Pékin naura pas besoin dintervenir directement, il suffit de suspendre laide alimentaire et énergétique à un pays qui, depuis une dizaine dannées, vit sous perfusion. Les premiers signes de leffondrement du régime ont été révélés au monde par lintermédiaire de téléphones portables entrés illégalement en Corée du Nord grâce aux réfugiés vivant en Chine. Ces téléphones ont permis aux Nord-coréens de rompre leur isolement, appelant leurs familles réfugiées en Corée du Sud, en Chine et au Japon. Grâce aux portables, le contrôle absolu de tout un peuple par un régime qui lavait enfermé dans un immense goulag a pu être déjoué. Lune des dernières dictatures communistes de la planète pourrait vivre ses derniers jours. Sa disparition serait un événement considérable, capable de bouleverser léquilibre de la péninsule coréenne. Même si la fin de Kim Jong Il est rassurante pour la communauté internationale, le sort des 24 millions de Nord-coréens quil a transformé en esclaves reste un énorme problème. La Corée du Nord a lhabitude de crier au complot. Mais elle ne lavait jamais fait avec autant de vigueur. Les dirigeants nord-coréens sont persuadés que les Etats-Unis vont envahir leur pays après avoir réglé le sort de lIrak et affirment être prêts à la guerre. Il est vrai que les initiatives du président américain lors du sommet de lAPEC à Santiago du Chili ont de quoi inquiéter Pyongyang. Après y avoir rencontré les dirigeants chinois, russe, japonais et sud-coréen, il a réussi à resserrer les rangs autour de lui sur le dossier nucléaire et à former un bloc uni face au régime nord-coréen, réunissant cinq des six pays engagés dans les négociations avec le régime de Kim Jong Il pour obtenir labandon de son programme darmement atomique. Selon les Américains, la Corée du Nord aurait produit ces deux dernières années une quantité de plutonium suffisante pour fabriquer six bombes nucléaires. Il est donc urgent de ramener ce pays à la table de négociations pour reprendre les pourparlers de Pékin. Et, selon la Maison Blanche, dès janvier 2005. Ces pourparlers sont au point mort depuis septembre. Pyongyang ne voulait pas poursuivre les négociations avec ladministration républicaine dans lespoir que le candidat démocrate John Kerry, réputé plus favorable à un dialogue bilatéral, emporterait ces élections. Pour convaincre les imprévisibles Nord-Coréens à reprendre le chemin du dialogue, George Bush serait disposé à faire preuve «dune certaine souplesse». Il pourrait, par exemple, augmenter laide alimentaire au régime communiste ou lui proposer une aide financière plus importante. A Washington, on assure toutefois que cette «souplesse» ne serait pas du goût des faucons qui lentourent. En attendant la réponse du nord-coréen Kim Jong Il, certains conseillers de George Bush ont comparé sa mise en garde à la Corée du Nord au «discours du président Ronald Reagan, appelant en 1987 les soviétiques au démantèlement du mur de Berlin». 65 nord-Coréens ont été donc arrêtés hier par la police chinoise à Pékin. Ces nord-Coréens ont été cueillis au petit matin dans deux maisons à lest de la capitale chinoise. Parmi eux se trouvaient deux sud-Coréens, membres dune association qui a pour but de venir en aide aux réfugiés nord-coréens. Ce groupe préparait son intrusion dans un établissement étranger, école ou ambassade. Le but étant dêtre envoyé en Corée du Sud. Le dossier des réfugiés nord-coréens devient de plus en plus sensible. On estime que 200 000 à 300 000 nord-coréens se trouveraient actuellement dans lempire du Milieu. Fuyant la famine et la répression, ils sétablissent près de la frontière entre la Chine et la Corée du Nord. Dautres sont montés jusquà Pékin. Ils vivent la plupart du temps dans des conditions déplorables, à la merci demployeurs qui nhésitent pas à les exploiter. Ces nord-Coréens sont considérés par les autorités chinoises comme des immigrés économiques clandestins, ils nont pas le statut de réfugiés politiques. Selon un accord entre Pékin et Pyongyang, ils peuvent, sils se font prendre, être renvoyés dans leur pays dorigine. Beaucoup de nord-Coréens cherchent donc à fuir la Chine pour se réfugier en Corée du Sud via un pays tiers. La technique la plus généralement utilisée est de sintroduire dans une ambassade étrangère. 140 personnes ont tenté laventure ces deux derniers mois. Jusquà présent la Chine les autorisait à quitter le territoire. Mais larrestation dhier fait craindre un durcissement de Pékin. Cette opération policière sest accompagnée de déclarations très musclées du ministère chinois des Affaires étrangères. Ce dernier sen nest pris, en autre, aux associations humanitaires, sud-coréennes principalement, qui aident les nord-Coréens, les menaçant dêtre sévèrement punis. Il a aussi demandé aux ambassades de ne plus permettre aux nord-Coréens de pénétrer dans leur enceinte. La Chine est en fait prise entre son alliance idéologique avec le régime de Kim Jong-il et la pression de la communauté internationale. La situation était déjà difficilement contrôlable pour les autorités chinoises. Elle devrait lêtre encore davantage dans les mois qui viennent : De plus en plus de nord-Coréens semblent prêts à fuir leur pays. En outre, la loi américaine sur les droits de lHomme en Corée du Nord va bientôt être appliquée. 20 millions de dollars par an seront fournis aux réfugiés nord-Coréens, largent devant principalement être donné aux associations humanitaires. Reste maintenant à savoir quelle suite sera donnée à ce coup de menton de Pékin. Dautres opérations policières seront-elles organisées ? Les nord-Coréens arrêtés seront-ils renvoyés dans leur pays ? La Chine bloquera-t-elle le départ des réfugiés se trouvant déjà dans lenceinte des ambassades ? Sur toutes ces questions, une partition importante peut-être jouer par la Corée du Sud. Le gouvernement a demandé à la Chine de ne pas envoyer en Corée du Nord les personnes arrêtées hier. Espérons quil sera entendu par les autorités chinoises. LAsie croit plus vite que le reste du monde et son économie est aujourdhui une grande dévoreuse de pétrole. Le continent produit 11% du brut mondial mais en consomme 21%. Il importe ainsi 44% de sa consommation. Or, la hausse des cours du pétrole, si elle se poursuivait, pourrait sérieusement mettre à mal la croissance économique en Asie, en provoquant une poussée inflationniste et une hausse des taux dintérêt. Selon la Banque Asiatique de Développement, «si les cours du pétrole restent à 50 dollars le baril, des ! revers importants vont en résulter». Avec le nouveaux prix recor d à plus de 55 dollars le baril on se demande si les économies asiatiques vont pouvoir continuer à résister comme elles lont fait jusquà présent. La flambée du cours du pétrole va certainement contraindre les pays asiatiques à abandonner une politique coûteuse de subventions qui vise à maintenir artificiellement bas des produits pétroliers de grande consommation. La Chine, lInde, lIndonésie, la Malaisie et la Thaïlande dépensent des milliards de dollars pour limiter la hausse de certains carburants. Cette mesure est nécessaire pour amortir limpact des hausses du pétrole sur les dépenses des ménages. Mais si les cours restent au niveau atteint ces derniers jours, le fardeau va devenir énorme et les gouvernements vont avoir du mal à ne pas laisser les prix augmenter. Certains pays, comme lIndonésie, ne semblent pas disposés à suspendre les subventions. Le Parlement indonésien vient dadopter un budget révisé qui prévoit un quadruplement des fonds alloués aux subventions des carburants pour cette année à 6,8 milliards de dollars. En outre, lIndonésie, seul pays asiatique de lOPEP, risque de devenir un importateu! r de brut dans dix ans, car sa production est en déclin. A moins que la relance des campagnes dexploration ne démontre lexistence de nouvelles réserves. Dans ce contexte morose, la Banque Asiatique de développement vient denfoncer le clou en révisant à la baisse ses prévisions de croissance. Pour 2005, la Banque prévoit une baisse à 6,2% contre 6,7% initialement prévu. Mais en dépit de sa voracité, lAsie semble être mieux préparée que dautres régions du monde à résister à un choc pétrolier en raison de ses énormes réserves de change et dune inflation très basse. Any Bourrier - ©RFI. Les révélations sur les activités nucléaires menées en Corée du Sud jettent le trouble sur les intentions de Séoul. Pour le directeur de lAIEA Mohamed El Baradei , elles sont particulièrement inquiétantes. Personne ne sait à quel pourcentage denrichissement duranium la Corée du Sud est parvenue ni si dautres révélations ne viendront noircir davantage le tableau. Séoul avait signé le traité de non-prolifération en 1975 et avait renoncé à larme nucléaire. Le fait que lenrichissement duranium et la séparation de plutonium naient pas été signalés à lagence est perçu aujourdhui comme une faute grave. Le directeur de lAIEA a donc convoqué une réunion de quatre jours à Vienne pour examiner cette question. Il y va de sa crédibilité, puisque les expérimentations sud-coréennes font planer le doute sur lefficacité du contrôle que cette agence exerce sur les pays soupçonnés de prolifération. Si, effectivement, les Sud-coréens ont réussi a produire secrètement du plutonium à partir de 150 kg duranium naturel, El Baradei devra notifier aussi bien le conseil des gouverneurs de lagence que le secrétaire général des Nations unies pour que des sanctions soient envisagées. La Corée du Sud se défend davoir lintention de fabriquer des armes nucléaires. Son ambassadeur auprès de lAIEA Cho Chang Ho a tout fait pour minimiser la portée de ces révélations en assurant quil sagit de «recherches isolées», menées sans laccord du gouvernement. Quoi quil en soit, les conséquences de cette affaire vont être lourdes. La plus importante est sans doute la menace quelles font peser sur la poursuite du dialogue sur le nucléaire nord-coréen qui devait reprendre dans quelques jours à Pékin. Pyongyang a sauté sur loccasion pour qualifier ces négociations dinutiles et a promis de les boycotter. Les nord-coréens ont également accusé les Etats-Unis de mener dans la péninsule coréenne la politique de «deux poids et deux mesures» en matière de prolifération. Reste à savoir quel est le but poursuivi par Séoul. Sagit-il de montrer que la Corée du Sud na pas été affaiblie par le retrait annoncé dune partie des troupes américaines stationnées sur son territoire? Ou sagit-il de durcir le ton à légard de la Corée du Nord, très courtisée depuis le sommet de juin 2000 à Pyongyang ? Le fait est que, après ces révélations, les relations entre les deux Corées et lavenir du dialogue inter-coréen sont bel et bien compromis. Les révélations concernant les activités nucléaires secrètes de la Corée du Sud suscitent des interrogations concernant les intentions du pays en la matière. La semaine dernière, les autorités ont reconnu qu'un laboratoire national s'était livré en 2000 à des expériences d'enrichissement de l'uranium ; jeudi dernier elles ont affirmé que le même laboratoire avait procédé en 1982 à des expériences nucléaires à base de plutonium. Si la Corée insiste sur le caractère purement académique de ces expérimentations on peut pour le moins douter de l'efficacité du contrôle exercé par les autorités sud-coréennes. C'est aussi l'autorité de l'AIEA, l'agence internationale pour l'énergie atomique qui est mise en doute. A l'ouverture du Conseils des gouverneurs, organe exécutif de l'AIEA, qui se réunit en ce moment à Vienne, Mohamed ElBaradei, directeur de l'agence, a déclaré qu'il était "très préoccupant que la conversion et l'enrichissement de l'uranium ainsi que la séparation du plutonium n'aient pas été signalées à l'agence comme exigé par les accords de garanties de non prolifération". Un rapport devrait être publié d'ici novembre. Les experts analysent donc avec soin les quantités et proportions de métal dont il est question pour savoir si derrière se cachent ou non des intentions nucléaires. D'un côté, certains affirment que la petite quantité d'uranium enrichi, 0,2 gramme, n'est pas suffisante pour produire des armes nucléaires. Mais de l'autre les inspecteurs de l'AIEA affirment que les activités de conversion sur trois sites non déclarés dans les années 80 avaient porté sur la production de 150 kilos d'uranium naturel. Or, cela intrigue les experts car le métal n'a aucun usage courant sous cette forme. La Corée du Sud fait tout son possible pour afficher sa bonne volonté dans l'éclaircissement de cette affaire. L'ambassadeur de Corée du Sud à l'AIEA a affirmé que les recherches passées n'étaient que des recherches isolées effectuées sans l'accord du gouvernement et que la Corée renonce sans équivoque à l'arme nucléaire dans le cadre d'une péninsule dénucléarisée. Mais il faut bien noter que la Corée du Sud ne s'est pas toujours défendue d'une telle volonté car dans les années 70 le régime de Pak Chung-hee avait eu l'ambition de se doter de l'arme nucléaire dans des fins militaires.
) nous ne les considérons pas comme des activités liées à des armements nucléaires mais comme des activités à petite échelle différentes en taille et en nature à celles menées par Pyongyang " a déclaré un officiel américain. Ces révélations risquent donc d'aggraver plus encore les relations entre les deux Corées en les mettant dos à dos. La Corée du Nord a bien sûr réagi en agitant le spectre d'une course aux armements dans la région et en dénonçant la politique américaine ambiguë en matière de prolifération. Les négociations qui devraient reprendre à la fin du mois à Pékin afin de dissuader Pyongyang d'arrêter ses programmes nucléaires semblent déjà compromises. En effet, la Corée du Nord et a déjà déclaré que les pourparlers à 6 étaient inutiles. Aujourdhui, nous parlons de la Corée du Nord et des prochaines discussions à 6 pour résoudre le problème nucléaire nord-coréen. La Corée du Nord, qui semblait plutôt se désintéresser du test sud-coréen denrichissement duranium, a soudainement critiqué les Américains sur la question nucléaire. Aux Nations-Unies, le représentant nord-coréen, Han Sang-ryol, les a accusés d'appliquer deux normes devant les tests nucléaires sud et nord-coréens, et a souligné quune telle attitude pouvait avoir des répercussions sur le devenir du programme nucléaire nord-coréen. La virulence de ces propos peut être interprétée comme une tentative d'affaiblir l'influence des Américains qui ne cessent de réclamer l'abandon complet de ses ambitions nucléaires, mais elle semble surtout être annonciatrice dun refus des Nord-coréens dassister aux prochaines discussions à 6. Si cela se vérifie, la situation politique entourant la péninsule pourrait devenir encore un peu plus volatile. Rappelons que depuis plusieurs mois, la Corée du Nord est suspectée davoir repris son programme nucléaire pour développer des armes de destructions massives. Et que cela a conduit cinq pays voisins à organiser des discussions à 6 pour résoudre la question et inciter Pyongyang à abandonner ses ambitions nucléaires. La prochaine série de discussions à 6 est prévue se tenir à Pékin, le 22 et 23 septembre. Cependant Pyongyang nest pas très enthousiaste à lidée dy participer et continue de tergiverser. Dans ce contexte, l'aveu sud-coréen du test d'enrichissement duranium était inopportun. De plus, il est intervenu alors que Pyongyang vient de subir plusieurs revers diplomatiques. En attendant, les cinq autres pays sactivent toujours pour que la réunion ait lieu. La Chine, lhôte et le président de ces discussions, a même envoyé une délégation à Pyongyang pour persuader cette dernière de se rendre à la table de négociation. Aujourdhui, Les responsables des délégations sud-coréennes, japonaises et américaines se sont rencontrés officieusement à Tokyo pour confirmer la tenue des discussions à 6 avant fin septembre. Et immédiatement après la rencontre, le responsable américain James Kelly, sest envolé pour Pékin pour informer le gouvernement chinois des autres sujets de la réunion. Finalement, il apparaît évident que ces deux cas nucléaires coréens sont différents. Car, en tant que membre de l'Agence internationale de l'énergie atomique, Séoul collabore étroitement avec l'Agence sur tous les sujets qui concernent le test. Et lors de la réunion du troisième trimestre de l'AIEA programmée le 13 septembre, on s'attend à ce que l'agence nen fasse pas un grand cas. Car la quantité d'uranium enrichi était négligeable, et le test n'a pas été destiné à développer des armes nucléaires. De même quil ne faut pas avoir dinquiétudes quant au prochain le conseil d'administration de l'Agence en novembre qui doit prendre une décision et dire si la Corée du Sud a violé l'accord de sûreté, en se basant sur le rapport des inspecteurs. Mais, dans le cas de la Corée du Nord, la situation est clairement différente. Parce que, dune part, Pyongyang n'est pas membre de l'AIEA et s'est retiré du traité de non-prolifération, dautre part, il refuse toute intervention internationale sur son programme nucléaire. Ainsi, la Corée du Nord devrait-elle essayer de dissiper les inquiétudes et les doutes de la communauté internationale au sujet de ses ambitions nucléaires. Elle devrait aussi se rendre compte qu'elle ne peut attendre aucune aide de leur part à moins de les abandonner. Et si elle veut vraiment devenir un membre responsable de cette communauté, elle doit dabord commercer par répondre positivement et franchement aux discussions à six. ¤ Spécial KBS 26/08 : Annonce de Pyongyang des règles immobilières du complexe industriel de Gaeseong. La Corée du Nord a annoncé le 25 août les règles immobilières définissant les droits de propriété et de succession des terrains du complexe industriel en cours de construction à Gaeseong. Ces règles adoptées pas le comité de la Convention Suprême du Peuple de Corée stipule quil est possible dhériter dune propriété dans le complexe lorsque le propriétaire meurt. Lhéritier apparent et le partage de la propriété héritée seront déterminés selon les lois du pays ou de la région dorigine du propriétaire. Cela signifie quun Sud-Coréen ayant une société dans ce complexe pourra léguer ses bâtiments ou son droit dutilisation du sol à ses successeurs lors de son décès. Pour ce qui est du terrain, lhéritier aura le droit dutilisation du sol tant quil paie les taux de la 11e année de contrat de bail. Le droit de propriété sera garanti pour 50 ans. Le règlement comprend pratiquement tous les points concernant lacquisition, le lotissement, la location, lachat et la vente, léchange, la donation, lhéritage et lhypothèque des bâtiments du complexe. Avec cette annonce, le projet de coentreprise devrait aller de lavant, le règlement posant les fondements légaux pour les firmes du complexe. En particulier, ce geste de Pyongyang va rassurer les sociétés qui vont sinstaller dans ce complexe. La Korea Land Corporation, une société sud-coréenne licenciée du projet Gaeseong, a annoncé que toutes les activités liées à limmobilier sont devenues possibles de la même façon quen Corée du Sud. Une autre société licenciée, Hyundai Asan sattend à ce que le projet saccélère, les outils légaux étant définis. Ainsi, le conglomérat sud-coréen considère que lannonce montre clairement combien ferme est la volonté de Pyongyang de mener à bien le projet. Les sociétés qui vont emménager dans le complexe à la fin de lannée ont bien accueilli la nouvelle. Le gouvernement sud-coréen a aussi exprimé sa satisfaction devant ce règlement. Il a soumis à lAssemblée Nationale un rapport pour utiliser 27 milliards de wons du Fond de Coopération Inter-coréen comprenant 24 milliards demprunt des deux sociétés licenciées pour la construction et la gestion des bâtiments du complexe. Dautre part, la Corée du Nord aurait lintention de reprendre le développement de la Zone Administrative Spéciale de Shinuiju, qui avait été arrêté il y a quelques années. Malgré les mesures spéciales pour améliorer son économie, prises le 1er juillet 2002, la Corée du Nord est toujours dans une impasse économique, aggravée par linflation et la dévaluation de sa monnaie. Le projet de Shinuiju a pour but dattirer plus dinvestissements de Corée du Sud et des pays occidentaux. Les experts pensent que la Corée du Nord veut créer quatre zones daffaires spéciales à Shinuiju, Gaeseong, aux monts Geumgang et dans la zone Najin-Sonbong. Lannonce des ces règles immobilières avec ces plans de développement devrait faciliter louverture de léconomie nord-coréenne et promouvoir léconomie de marché et autres réformes intérieures. Louverture du complexe de Gaeseong devrait aussi aider la reprise de léconomie nord-coréenne. Il y a eu récemment des signes négatifs dans les relations inter-coréennes, comme le silence de Pyongyang après lannulation des 15e rencontres ministérielles inter-coréennes qui auraient dû avoir lieu le 3 août dernier. Le Nord na pas non plus répondu aux appels du Sud pour des contacts au sujet de la suppression des objets de propagande le long de la ligne de démarcation. De plus, la Corée du Nord semble avoir une attitude négative sur la reprise des 3e pourparlers nucléaires, accusant les Etats-Unis dhostilité envers le Nord. Certains prédisent que les relations inter-coréennes vont rester au point mort pour une longue période. Contre un tel revers, les règles immobilières devraient relancer les échanges inter-coréens et la coopération économique. Il est espéré que ce geste de Pyongyang est un nouveau pas vers la réconciliation inter-coréenne et la prospérité économique. La tristesse et la colère. Ce sont les deux sentiments qui dominent aujourd'hui en Corée après l'exécution de Kim Sun-il en Irak. Les sud-Coréens ne s'attendaient pas à subir un tel choc. Le pays du Matin calme est peu habitué à être mêlé aux conflits internationaux et cette décapitation fait l'effet d'une douche froide. Les télévisions diffusent depuis ce matin les images de l'appartement de la famille de cet interprète de 33 ans. Une chapelle ardente y a été dressée avec les traditionnelles offrandes. Partout dans le pays des messages de condoléances affluent. Des sites Internet ont été spécialement créés pour l'occasion. Les journalistes rappellent que Kim Sun-il était un civil, passionné de civilisation arabe. Il devait revenir dans son pays le mois prochain pour fêter les 70 ans de son père. Les conséquences politiques d'un tel acte sont difficiles à prédire. On voit déjà apparaître deux attitudes contradictoires. Il y a d'abord un réflexe patriotique. Certains Coréens ont changé d'avis. Ils sont désormais prêts à soutenir l'envoi de troupes supplémentaires en Irak. Ils ne comprennent pas pourquoi les terroristes s'en sont pris à l'un des leurs ; alors qu'on leur explique depuis des mois que les forces sud-coréennes ne vont pas dans le pays du Golfe pour se battre, mais pour reconstruire un pays ravagé par la guerre. Cet argumentaire est repris aujourd'hui par le président de la République. Roh Moo-hyun est intervenu ce matin à la télévision. Il a exprimé sa tristesse et a parlé de "crime contre l'humanité". Mais il a aussi voulu se montrer ferme. Il n'est pas question de remettre en cause les plans sud-coréens en Irak. Le message est simple : ne pas céder au chantage terroriste. Cette position est partagée par Park Guen-hye, la présidente du principal parti d'opposition : le GPN, le Grand parti national. Mais cet unanimisme n'est que de façade. Les divisions n'ont pas disparu d'un coup de baguette magique. Un groupe de 50 députés va demander au gouvernement de revoir sa position. Un texte sera déposé en ce sens à l'Assemblée nationale. On retrouve des parlementaires du parti majoritaire Uri, ainsi que des députés conservateurs appartenant au GPN ou au PDM. L'opposition des associations civiques n'est elle non plus pas étouffée par cette affaire. Elles condamnent l'exécution de l'otage mais maintiennent leur hostilité à l'envoi de troupes supplémentaires en Irak. Si ce plan est mené à bien, menacent-elles, il y aura d'autres victimes sud-coréennes innocentes. Une manifestation à la bougie doit d'ailleurs être organisée ce soir dans les rues de Séoul. D'autres rassemblements du même type pourraient se tenir dans les jours qui viennent. Une première prise de contact utile mais sans résultat concret. Cest ainsi que lon peut résumer la rencontre hier entre des militaires des deux Corées. Cest la première fois depuis la fin de la guerre en 1953 quune réunion se déroulait au niveau des généraux. Elle avait lieu au nord du 38ème parallèle au mont Geumgang et a duré de 10 heures du matin à 4 heures de laprès-midi. Les deux délégations se sont mises daccord pour faire des efforts afin déviter les accrochages maritimes en mer Jaune. Mais aucune mesure na été prise pour le moment. Les deux parties ont toutefois promis de se retrouver. La nouvelle session aura lieu dans une semaine en territoire sud-coréen, au mont Seolak. On peut être déçu dun aussi faible résultat. On peut aussi se réjouir que la voie du dialogue ait été ouverte. La Corée du Nord a longtemps refusé de discuter avec le Sud, préférant le face à face direct avec les Etats-Unis. Cela marque sans doute une volonté douverture de Pyongyang qui intervient après la visite du Premier ministre japonais, Junichiro Koizumi. La première rencontre avait été organisée à lorigine pour régler la douloureuse question de la guerre du crabe. Depuis plusieurs années, des accrochages ont lieu entre des navires de pêches des deux pays en mer Jaune, dans une zone à la limite de la frontière maritime et particulièrement riche en crabe. Or les Coréens raffolent de ce crustacé. Et la Corée du Nord na jamais reconnu cette limite, pourtant acceptée par les Nations-Unies. Les bateaux nord-coréens ont donc pris lhabitude de franchir cette frontière. Depuis 1999, une douzaine de personnes seraient mortes dans ces accrochages, impliquant les Marines sud et nord-coréennes. Hier, Séoul a fait des propositions pour régler le problème. La philosophie générale est de faciliter la communication entre les deux Etats pour intervenir le plus rapidement possible. Pourquoi pas par exemple installer une ligne téléphonique directe entre les deux autorités militaires? On peut aussi faire en sorte que les bateaux des deux côtés utilisent la même fréquence radio. Mais pour linstant, on la dit, rien na été décidé. En revanche, le Nord a réaffirmé ses exigences. Larrêt des exercices entre les armées américaine et sud-coréenne ainsi que le retrait du porte-avion Aegis en mer de lEst. Le Nord réclame aussi labandon des activités de propagande qui ont lieu le long de la frontière. Par ailleurs, les sujets sensibles ont été évités. Que ce soit le dossier du nucléaire nord-coréen ou le retour des corps des soldats décédés pendant la guerre de 1950 à 1953. 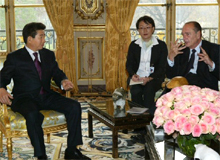 ¤ Chronique Asie de RFI, 15/05/2004 : Le Fonds Monétaire Asiatique verra-t-il enfin le jour ? Le 15 mai, treize pays vont se pencher sur le berceau de ce nouveau-né si attendu: le Fonds Monétaire Asiatique. A Chenju, les dix membres de l'Asean, le Japon, la Corée du Sud et la Chine doivent signer un immense projet portant sur leur union économique et financière. S'ils se mettent d'accord sur ses grandes lignes, ils seront contraints à l'abandon d'une partie de leur souveraineté au profit de cette nouvelle autorité financière. Ils devront en effet accepter la surveillance de leurs économies par un organisme régional et supra-national. Le premier pas vers l'union a été la création d' un marché régional d'obligations. L'année dernière, le premier "Marché obligataire asiatique", a vu le jour. Il est à l'origine du chapitre le plus ambitieux du projet d'union: la réunion d'obligations nominatives dans un panier spéculatif de monnaies régionales pour aboutir à la monnaie unique de l'Asie de l'Est. La comparaison de leur démarche avec celle de l'Europe n'est pas fortuite. Comme l'Europe, la région a une économie forte mais reste divisée et ses membres ont des intérêts contradictoires. Arriver à gommer ces divergences et faire comme les européens est aujourd'hui le pari des ministres des finances asiatiques. Des considérations stratégiques sont à l'origine de l'intérêt pour l'union. Dans le cas du Japon, d'où vient l'essentiel des propositions pour créer l'union monétaire, il est clair que Tokyo cherche à renforcer son rôle économique et financier dans la région avant que la Chine ne devienne trop puissante. Ce sera également l'occasion d'imposer le yen comme pierre angulaire de la future monnaie unique. Autrefois, l'intégration financière était un vague souhait. Mais aujourd'hui le développement des flux commerciaux rend indispensable l'existence d'un marché de capitaux large et stable, en raison de la multiplication des accords de libre-échange dans la région. Le plus difficile sera de trouver un consensus entre des pays qui sont concurrents sur les marchés d'exportation et pour attirer des investissements. Quoi qu'il en soit, c'est le moment ou jamais de profiter de la bonne santé des économies asiatiques, dont la moyenne de croissance sera de 7% cette année. Any Bourrier - Chronique Asie de RFI 15 mai - ©RFI. La Corée du Nord a averti que les discussions multilatérales sur son programme nucléaire vont être très serrées. Auparavant, le régime nord-coréen avait multiplié les conditions pour participer à cette rencontre. Sa principale exigence: que les Etats-Unis cessent leur hostilité à son égard. La Corée du Nord a également exigé que les Etats-Unis lui donnent une aide économique consistante. En revanche, la demande américaine d'un démantèlement complet, vérifiable et irréversible du programme nucléaire du Nord est restée sans réponse. La cohérence n'est visiblement pas le fort du régime de Kim Jong Il. Car, tout en faisant preuve de fermeté, il a assoupli ses positions sur des dossiers sensibles. Il y a eu d'abord le dégel des relations avec le Japon et la reprise du dialogue entre les deux pays. Un dialogue gelé en raison de l'affaire des Japonais enlevés par les services secrets nord-coréens dans les années 70. Par conséquent, le premier ministre japonais Junichiro Koizumi envisage de se rendre à Pyongyang fin mai. Il essayera de ramener à Tokyo les enfants des cinq Japonais enlevés par les nord-coréens. En septembre 2002, il avait obtenu avec succès leur libération mais leurs enfants étaient restés dans la capitale nord-coréenne comme otages du régime. L'autre preuve de souplesse est l'ouverture de la frontière à l'assistance de la Corée du Sud, à la suite de la catastrophe ferroviaire de Ryongchon. Enfin, et c'est une première, Pyongyang a donné son feu vert à l'organisation d'une rencontre militaire de haut niveau: les commandants des armées du Nord et du Sud se rencontreront à Séoul lors d'un sommet militaire inédit puisque les deux Corées sont toujours en guerre. Cette volonté d'ouverture est perceptible également en Corée du Sud. En effet, en juin l'Assemblée Nationale sud-coréenne, qui vient d'être élue, va débattre un projet visant à supprimer de la Loi de Sécurité la classification de la Corée du nord comme «pays ennemi». Cette évolution est la conséquence des pressions de la Chine. 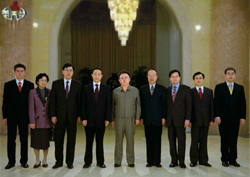 Lors de sa rencontre avec Hu Jintao à Pékin, le 19 avril, celui-ci avait conseillé Kim Jong Il de«baisser le ton» et de ne pas «donner au monde l'image d'un pays va-t-en guerre». Il avait également rassuré Kim Jong Il en lui affirmant que les Etats-Unis ne lanceraient pas une guerre contre la Corée du Nord comme ils ont fait en Irak. Le dirigeant nord-coréen a été d'accord sur tout sauf sur le démantèlement son programme nucléaire. Car la Corée du Nord ne veut pas faire des concessions et préfère attendre le résultat des élections américaines dans l'espoir de négocier avec le candidat du Parti Démocrate.